COLUMBUS, OHIO — OCTOBER 27, 2015 — Scriptel® Corporation (Scriptel), a long-time provider of electronic signature solutions and capacitive pen digitizing components, today announced the start of regular shipments of its ScripTouch® signature pads using the latest version of its patent-pending EasyScript 2.0 interface. Building upon the original EasyScript API released in 2013, the EasyScript 2.0 API allows developers to deliver a significantly upgraded user experience by supporting real-time rendering of signatures at a higher resolution while offering greater system flexibility, including support for hardware thin clients and verification as Citrix Ready®. Electronic signature capture pads enable the truly paperless business by eliminating that last step that typically still needs a printer and a scanner: signing a form. Developers are building cloud-based and browser-based solutions to manage paperless digital workflows and need to be OS-independent, browser-independent and client hardware-independent. EasyScript offers the solution. The original EasyScript was developed to solve an issue many IT administrators and software developers have faced: how to support USB electronic signature pad hardware in browser-based applications without needing additional drivers and installed “applets” that create potential security issues and trigger frequent updates. By innovatively adapting a solution commonly used for card swipers, barcode readers and other character-based POS peripheral devices, Scriptel solved this issue for electronic signature capture. Leveraging native OS support for keyboards, a Scriptel signature pad with the EasyScript interface emulates a USB keyboard and sends signature coordinate data to the application encoded as keystrokes. Many of these features were developed at the request of Scriptel’s software partners. A critical concern was forward and backward compatibility of Scriptel signature pads with the EasyScript interface and applications remaining with the original EasyScript API or adopting the new EasyScript 2.0 API. 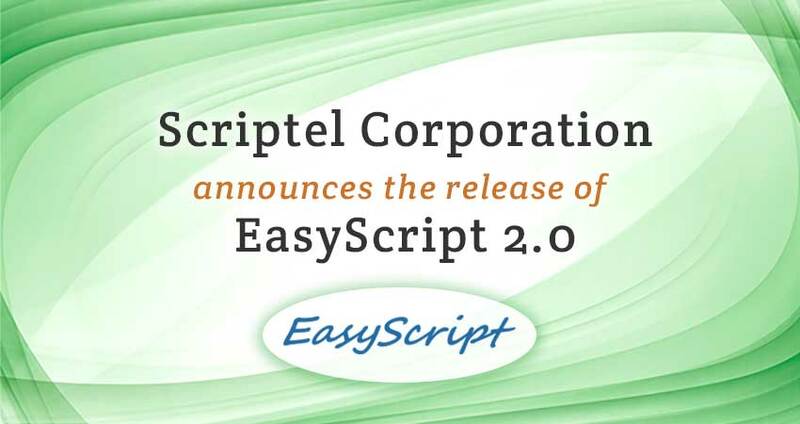 Scriptel worked with its partners to manage this transition so that all Scriptel signature pads can now ship with the new EasyScript 2.0 capabilities built-in and ready to use without causing applications based on the original EasyScript to fail.